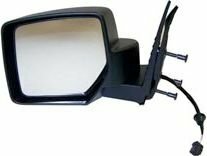 Upgrade or replace those beat up mirrors with a new Quadratec replacement mirror. These high quality mirrors can directly bolt to any 08-10 Liberty door. Each mirror application has been designed to original equipment specifications to replicate the look and performance of factory mirrors.